It was an interesting Thursday for U.S. Sen. Susan Collins, when her 2020 re-election campaign picked up an endorsement from a moderate Democratic colleague and a nationally known potential opponent declined to run against her. The endorsement from U.S. Sen. Joe Manchin, D-West Virginia, and the decision from Susan Rice, the former U.S. ambassador to the United Nations, are bigger curiosities to a national political audience than a Maine one. They underscore a deep nationalization of the 2020 U.S. Senate race here that will probably be the priciest campaign in state history. Manchin is an atypically moderate Democrat, and he and Collins share similar records. In a C-SPAN interview on Thursday, Manchin said he would “go up and campaign for Susan Collins” and it “would be an absolute shame” to lose her in the Senate. He noted that he’d be making fellow Democrats unhappy by saying that about a Republican senator in a nationally targeted race in 2020. But the context of the endorsement makes it less surprising. Manchin is a moderate who survived re-election last year in a red state that President Donald Trump won by a bigger margin than any other in 2016. In the last Congress, VoteView ranked him as the most conservative Senate Democrat and Collins as the most liberal Republican. The two are longtime allies who have worked on many issues together. Just after Collins made her high-profile October announcement that she would vote for U.S. Supreme Court Justice Brett Kavanaugh, Manchin confirmed that he’d vote for Trump’s nominee as well. More than any other, that vote has made Collins a Democratic target in 2020. 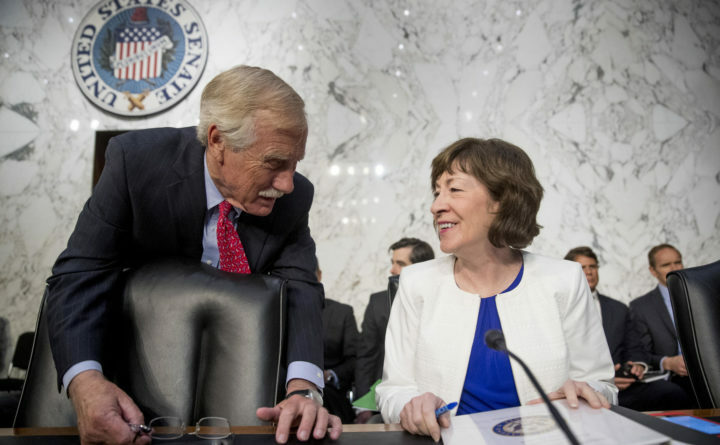 Collins was endorsed in 2014 by U.S. Sen. Angus King, an independent who caucuses with Democrats and is more liberal than Manchin, but that election wasn’t really contested by national Democrats and Collins won a fourth term easily. Moves like this will give Collins ammunition to burnish the moderate credentials that Democrats are trying to neutralize. Collins may not have her first high-profile Democratic challenger until the early summer. In the words of the Associated Press, Rice “tantalized” national Democrats by floating a potential Senate candidacy after Collins’ vote on Kavanaugh, though she almost immediately seemed to walk it back. Her late mother was born in Portland and she is a trustee of her mother’s home in Lincolnville. While she would have lent some national star power to the race, her test balloon was never taken too seriously by Maine Democrats and it’s unprecedented in Maine politics to ascend to high office without a political history in the state. Things seemed to fizzle after she appeared at an October fundraiser for Gov. Janet Mills. She said at a New York City event on Thursday that she wouldn’t run, though she didn’t rule out a future run in Maine or elsewhere. House Speaker Sara Gideon, D-Freeport, is seen as the likeliest Collins challenger by most observers. In a Thursday text message, she said there is no strict time frame for a decision on running, saying she’s fulfilling legislative duties “with full focus this session.” That would seem to indicate a decision after the 2019 legislative session, which is scheduled for June. A poll last month by Critical Insights showed Collins leading Gideon with 51 percent support to 29 percent, but 40 percent of voters didn’t know enough about Gideon to evaluate her. Collins is sitting on a $4.4 million war chest driven by large, out-of-state donors that is effectively matched by nation Democratic crowdfunds promised to aid an eventual Collins opponent after the Kavanaugh vote. The eventual Democratic nominee may not have to work hard to find money either on a national 2020 map that leaves Democrats with few better pick-up opportunities than Maine — which is still an uphill one. The Legislature’s watchdog group meets this morning, and it could call for a review of Maine’s indigent legal services system. The consideration is a holdover item from a meeting last month, but in the interim, the Sixth Amendment Center released a critical study on the state system, which provides legal representation to indigent people accused of crimes. The group last week said it had “serious concerns” over the lack of financial oversight and safeguards within the system, which serves as an alternative for a state defender’s office. Tune in here. Today is also Mills’ 100th day in office — if you count her inauguration day. To celebrate, she plans to sign a bill into law at 1 p.m. in her office that will guard against wage discrimination. LD 278, from Sen. Cathy Breen, D-Falmouth, bars future employers from asking about prospective employees’ wage or compensation history before extending a job offer. Violation of the new provision could result in a fine up to $500. — A bill from Rep. Drew Gattine, D-Westbrook, to restore certain social services for non-citizens in Maine is expected to draw a crowd this morning before the Committee on Health and Human Services. The bill aims to restore access to state-funded food assistance programs, the Temporary Assistance for Needy Families program and Medicaid benefits for income-eligible immigrants who lawfully live in Maine and are seeking legal status. This includes asylum seekers awaiting approval and immigrants waiting for authorization to work. Listen here. — A bundle of county jail funding bills will come before the Criminal Justice and Public Safety Committee this afternoon for a potential vote. Most of the five bills vary slightly, but two would require the state to fund at least 20 percent of the operating cost for each county jail. The committee will also consider a bill from House Minority Leader Kathleen Dillingham, R-Oxford, that would impose a waiting period before law enforcement officers make public the names of victims of crimes or accidents. Listen here. — State energy regulators granted a key permit to Central Maine Power’s $1 billion hydropower transmission project. The Maine Public Utilities Commission voted unanimously Thursday to grant CMP the needed certificate of public convenience and necessity for its project, saying the benefits of the project outweigh its costs and detriments. The three commissioners agreed with their staff’s recommendation on March 29. CMP still must win approval from other state and federal regulatory agencies, and opponents will continue to fight the project on multiple fronts. Starks became the latest town along the corridor’s path to formally express opposition. — Republican efforts to tinker with Maine’s minimum wage law fizzled in the Maine House of Representatives. Four Republican-sponsored bills aimed at slowing voter-approved increases in the minimum wage or offering other forms of relief to employers lost in floor votes Thursday, as majority Democrats solidly voted against them. The minimum wage has been a partisan flashpoint in the Legislature for years, with Republicans arguing that it harms small businesses, especially in rural Maine. While Democrats counter that raising the minimum wage benefits the overall economic picture for most Mainers. — Another small Maine hospital has made big changes in an effort to adapt to fiscal challenges. Pen Bay Medical Center in Rockport ended 2018 with a small surplus after recording more than $15 million in losses during the two previous years. Hospital executives recruited more primary care practitioners, expanded pediatrics and gastroenterology services and found $2 million in operational savings last year. Administrators will try to find $2 million more in savings this year as they work to improve the hospital’s rating while adding office space for physicians and possibly an urgent care center. — The president apparently tried to have people held by immigration officials released in places that would harm his political adversaries. The Washington Post reports that White House officials proposed transporting detained immigrants to sanctuary cities at least twice in the past six months – once in November, as a migrant caravan approached the U.S. southern border, and again in February, amid a standoff with Democrats over funding for Trump’s border wall. The state holiday that Mainers will celebrate on Monday has vexed editors for years. The holiday’s official title in Maine is Patriot’s Day, with the apostrophe before the S. Technically, that means we are celebrating only one patriot. Massachusetts, the only other state to observe the holiday that honors colonists who launched the fight for independence at the battles of Lexington and Concord, spells it Patriots’ Day, using the plural possessive. While I hate to admit it, that makes a lot more sense. Past legislative efforts to adjust Maine statute so that the holiday could honor multiple patriots have fizzled. I would suggest that we dump the apostrophe altogether, given that the holiday honors patriots but is not owned by them — but that’s next-level nerdery that would never survive the legislative process. Republicans in Cumberland and Gray have picked KC Hughes of Cumberland, who runs a Portland screenprinting business, to run in a June 11 special election to replace former Rep. Dale Denno, who resigned last month. Thursday’s version of the Daily Brief didn’t include him alongside the Democratic candidate, former Rep. Stephen Moriarty of Cumberland.